Following the release of their latest album, Borrowed Heaven, The Corrs spoke to Louise Carroll just before they started their largest North American tour. Who could imagine that a group of siblings from Dundalk, County Louth would fuse Irish traditional music with modern pop, sell over 30 million albums and gain worldwide attention and acclaim? Young, rich, and gorgeous, The Corrs have taken the mantle as the representatives of the new Ireland, where massive success is a possibility and life is good. Very good. It all began almost fifteen years ago, long before they broke through in America with their 2000 smash hit “Breathless” off the album In Blue. In Dublin in 1990, there was a casting call for a musical comedy called The Commitments. Jim Corr decided he and his sisters should audition together as the band from Roddy Doyle’s novel. Although none of them made the cut as the lead characters, Andrea was cast as Sharon Rabbitte, sister to the band’s manager Jimmy. But more importantly, they met the film’s musical coordinator John Hughes, who is still their manager today. So important to The Corrs is Hughes, that when they are split two and two on a vote, he casts the tiebreaker. The Corrs haven’t changed their roles since those early days. The exception is that initially Jim was the leader of the band, being the eldest in the family (he’s now 39). But before long, the others were also taking charge and now they make decisions together. Jim plays guitar, and Sharon plays the violin and fiddle. Caroline plays drams, and is one of the few highly successful female drummers in the music industry. Andrea, the youngest, is the lead singer and plays the Irish tin whistle. The band writes and arranges the songs together, and Sharon and Andrea pen most of the lyrics. Not all of Borrowed Heaven is a throwback to the 80s. 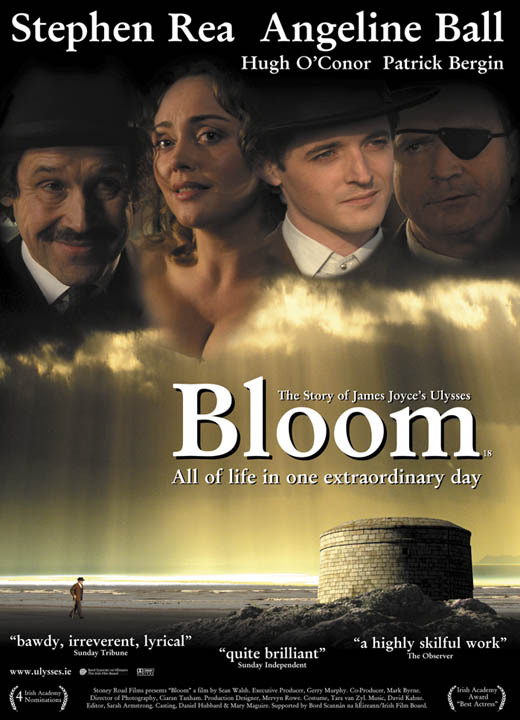 “Time Enough for Tears” was written by Bono, Gavin Friday and Maurice Seezer for the 2003 Jim Sheridan movie In America and doesn’t echo any specific musical era. It’s a timeless, delicate ballad that captures Andrea’s voice at its best. Nominated for a Golden Globe award, “Time Enough for Tears” is the only song on the album not written by The Corrs, which explains why is doesn’t sound like the rest of the album. In addition to Bono, other collaborators on the record include the South African band Ladysmith Black Mambazo, who sing on the title track, bringing African chants and a prayerful tone to the song. In contrast to that reverence, the song “Humdrum” exhibits a modern techno influence and Andrea depicts married life with more than a touch of irony. “I want to take you for granted/forget your birthday/drift while you’re talking/and shrink all your clothes,” she sings. The song is the opposite of her romantic relationships, she says, which are anything but domestic. “In my life, everything is very high intensity in love; because I’m always moving and it’s never domestic and mundane.” Andrea and Jim are the only unmarried Corrs, and collaborated together on “Humdrum.” They enjoyed poking fun at settling down with the kind of dry wit you’d expect from the Irish. Although the album permeates with disparate influences, its polished sound and upbeat lyrics tie it together as a cohesive work. Throughout all the songs you know you are listening to an Irish band with the occasional fiddle, tin whistle or even the bagpipe. “It’s important to us to have a real Irish flavor on our albums. Part of us would be missing without it,” says Sharon. Although large-scale commercial success in the U.S. takes a fair amount of luck, The Corrs have a distinct business-savvy that has served them very well over the years. Jim explains, “We’ve known intuitively what is going to work for us and what isn’t.” Aside from good instincts, it has only helped their appeal that the sisters are as photogenic as they are. But being good-looking does not a music career make. Real talent is a requirement. And The Corrs are unique because there is no other group that sounds like them. Whereas Jessica Simpson could change places with Christina Aguilera tomorrow; no other band could fill the shoes of the Corr family. They are true musicians who take their craft seriously. The diversity of their musical skills and their ability to play various instruments enables them to create a unique sound. “We can call on both the classical and the traditional Irish music, and that’s part of the secret of our success,” Jim says. Looking forward to their conquest of the United States, The Corrs are as ambitious and confident as ever. With 15 years in the music business under their belt, they still see a long musical future before them. Jim says, “We love what we are doing and we’ll continue doing what we’re doing as long as we love it, and as long as people love listening to it. In addition to being the band’s lead singer and tin whistle player, Andrea is the family thespian. Her first film was The Commitments, and she was cast in another Alan Parker film Evita, playing Peron’s mistress and Madonna’s nemesis. Her upcoming feature is her most significant role to date and combines both her acting and musical talents. Andrea plays Anne, a fiddle player living in County Clare in the 1970s. The film is going to be retitled for its March 2005 release, but so far has been called The Boys and Girl From County Clare. Andrea felt that she related very closely to her character in the film. “The thing is I believed everything that was in the script that the girl said and what she went through. I believed it. And that’s half the battle.” Andrea had a particularly unusual coming-of-age herself, becoming a famous pop star as a teenager. And a few years ago she was voted the most beautiful woman in the world in a UK poll. Asked if she has adjusted to all the attention paid to her beauty, she says it has become less and less important as she gets older. She happily says how much she enjoyed turning 30 this year. “You’re very vulnerable anyway as a woman, and in those adolescent years it’s more difficult. Now I have the spectrum of seeing how little it matters. I feel just the same as everybody but more exposed because I’m in the public eye,” she says. Time catches up with everybody, but not Don Keough it seems. At a stage of life, 77, when most people are catching the senior specials at McDonald’s or watching the sunset from a rocking chair over the Florida coast, Don Keough is as hard-charging and successful as ever. Warren Buffett suspects that his friend from their Omaha days half a century ago has a nuclear reactor for a heart and says he still hangs around with Keough because he is one of the few people in life who move him up. He recently appointed Keough to the board of Berkshire Hathaway because he is the most trusted pair of hands Buffett knows in the business world, a man he would trust with his life. Buffett also insisted that Keough rejoin the board of Coca-Cola when the company hit troubled waters. “Don Keough introduces you to his world and people respond to that; it is very unique. When you are around him, you are learning something all the time. Like all top businessmen, he is functioning at a very high level. It is like watching Ted Williams swing a baseball bat — if you watch it long enough, you will learn how to swing better yourself,” Buffett said in an exclusive interview with Irish America. Buffett’s opinion is shared by many other giants of American business. Keough has carved out a unique niche as the elder statesman of American business, a man of absolute integrity whom the rich and powerful turn to for advice. It is easy to see why he is considered such a powerhouse. As President and Chief Operating Officer of Coca-Cola, he and Chief Executive Roberto Goizueta oversaw the growth of the company from a $4 billion evaluation when they took over in March 1981 to over $80 billion when their reign ended. It was the most successful tenure in the history of the world’s most famous franchise. Keough was not done, however. Soon after retirement, he took over as Chairman of the New York investment bank Allen and Company and has helped put together some of the biggest deals of the past decade. Not bad for a farm boy from Maurice, Iowa, whose family farm was burned down when he was just two years of age and the family had to start all over again in nearby Sioux City. Not that the Keoughs were unused to hard times. His great-grandfather had sailed from Wexford to escape the Irish famine. His grandfather was an Iowa pioneer, eking out an existence for him and his family from the unyielding plains. So nothing ever came easy to the Keoughs. From such unpromising beginnings, Don Keough rose through the business world to the very pinnacle of the most famous company on earth. It was a Horatio Alger type rise, one that defies comparison in this modern era. Through it all he has maintained the kind of business discipline and foresight, sunny disposition and optimistic outlook that mark him as a true original. And he is far from finished. This year he was in the headlines again, including several front-page articles in the Wall Street Journal and a cover story in Fortune magazine as he managed the search for the next Chief Executive of Coca-Cola. Needless to say, he got his man in the end and the company looks poised for new growth and direction. As with everything else he gets involved in, Don Keough was a steady hand on the tiller and a cool head in a crisis. We are delighted he has agreed to be our keynote speaker for our 2004 Wall Street 50. At a time when America is coming under criticism from many quarters, let us not forget how truly unique this country is. If there is any doubt about that ask an immigrant. One of the many I’ve spoken to in the last two weeks is Nelli Tan from Burma. Nelli has worked in housekeeping at St. Mary’s Hospital for the last 30 years since she immigrated to San Francisco in 1974. She never gets a weekend off but she is very happy to be here. “You work hard, but you have freedom and you’re not scared every time you do something they are going to put you in jail,” she says. I’ve been seeing a lot of Mrs. Tan because a close relative of mine, an immigrant, is currently in St. Mary’s recovering from a stroke. Were she still in Ireland, where she might have had to travel up to a hundred miles for emergency treatment, she would probably be dead. Here in St. Mary’s, she’s receiving excellent treatment. Among her caregivers and health professionals are immigrants from China, Nicaragua, Russia, Mexico, and the Philippines, and all of those I’ve spoken to regard being allowed to live and work in America as a precious gift. And like Native Americans who believe that a gift should be passed on, these immigrants are providing valuable service in return for the freedom they enjoy. President Reagan, whom I often disagreed with, but I loved for his optimism and belief in America (see the story on his Irish roots, page 12), in a 1994 speech to a group of young students reminded them that anyone from any corner of the world can come to the United States and become an American. President Reagan said, “Some may call it mysticism if they will, but I cannot help but feel that there was some divine plan that placed this continent here between the two great oceans to be found by people from any corner of the earth — people who had an extra ounce of desire for freedom and some extra courage to rise up and leave their families, their relatives, their friends, their nations and come here to eventually make this country. It’s sad to say that President Reagan’s “brotherhood of man” and the very ideals that this country is built on is becoming a thing of the past, as America closes its doors and you read about deportations on a daily basis. What will America be like when young Claire Cassidy grows up? “We are lucky that the war is being fought in Iraq and not in our country. Even though personally I don’t think the war should have started,” Cassidy says. From Ballyporeen to the White House, Niall O’Dowd looks at President Reagan’s Irish background, and recalls an interview with the President’s brother, Neil. Thus did President Ronald Wilson Reagan announce himself when he visited the Irish village of Ballyporeen Co. Tipperary. It was in June of 1984, and it was, perhaps, the President’s most explicit statement on his pride in his ethnicity. It’s a long way from Ballyporeen to Dixon, Illinois (population 15,700) where Ronald Reagan, 40th President of the United States, spent his formative years from 1920 to 1929. Though he was born in nearby Tampico in 1911, the years Reagan spent in Dixon shaped the man more thoroughly than any others, he claimed in many interviews throughout his life. Dixon is a typical Mom and Pop town, deep in the heartland of the Midwest — dusky hot summers, wrenching cold winters, and conservative values that change little with the seasons. During those hot summer nights Ronald Reagan and his brother Neil would often cross the street to O’Malleys’, the home of their best friends, Edward and George O’Malley. Back in 1984, on the eve of Reagan’s historic trip to Ireland, Ed O’Malley, then 73, and a lawyer in his hometown, recalled his boyhood friend. He was the same age as Ron and Ed’s older brother, George, was the same age as Neil. They had been an inseparable foursome for 10-odd years. “No, I never thought he’d make President,” he told me. “He was just one of us, an Irish kid growing up on our block.” Actually, Ed remembered Neil as the outgoing one, while Ron would hold back, often staying in to read books in his bedroom. Over at the O’Malleys’ though, Ron seemed happy. Oftentimes he and Neil would stay over, sleeping together in wicker chairs on the outside porch as the hot Midwestern nights rolled by. On the day we spoke Ed recited the tale of Granuaile O’Malley, the pirate queen, who once stood alone against the British Queen Elizabeth. These were the kinds of stories Mr. O’Malley told his children and the neighbors’ kids. Jack Reagan was remembered as a “black Irishman,” tempestuous, given to drinking bouts, and often out of work in the Depression. But O’Malley confirms that Ron took far more after his mother, a Scotch Presbyterian of strict morality. Neil, by then a retired advertising executive living in San Diego, had long conversations with the President about the family’s Irish roots. He remembered that after his brother’s visit to the “old sod” in the late 1960’s when he was Governor of California, he came back more enthused than ever about the genealogy of the family. Despite his enthusiasm for his Irish roots President Reagan had often gotten them wrong. For years he proudly displayed a coat of arms given to him in his California governor days by an amateur genealogist. Once he discovered it was bogus, a furious Reagan ordered a new coat of arms, this one bearing no references at all to his Irish ancestry. For years, Reagan proudly referred to his ancestral clan, The O’Regans, as the branch who defended the pass through the Slieve Bloom Mountains in Ireland for 11 centuries. The clan’s motto, “The Hills Forever,” was one often quoted by Reagan. Unfortunately, he had the wrong branch of the family. However, another claim that he was related to the High Kings was true. The O’Regans were once one of the four original tribes of Tara, seat of the high kings. Unlike John F. Kennedy, the only other President of identifiable Irish Catholic roots, Reagan’s knowledge of Ireland, its history and culture was patchy at best. Though Reagan made reference to “the very rich heritage my father has left me,” the late Charles McCabe an influential San Francisco columnist, once went so far as to speculate that Reagan had deliberately obscured his Irish Catholic roots, deeming them unhelpful in his rise to political power, particularly among his wealthy WASP friends. Reagan took the time to deny the charge, a clear indication that the allegation stung. 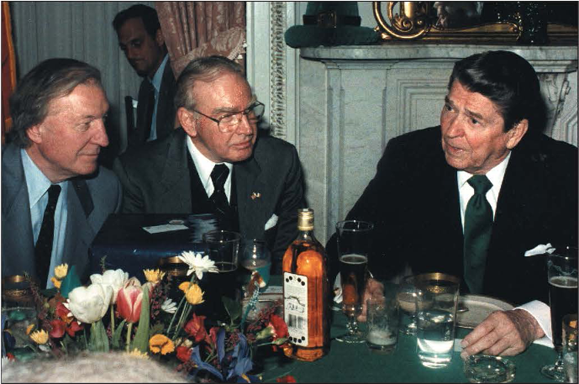 Left to right: Taoiseach Charles J. Haughey, Speaker Jim Wright, and President Reagan share lunch and a bottle of Irish whiskey on Capitol Hill in 1987. Ronald Reagan was very much the product of an emigrant Catholic ethos. He was the great-grandson of Michael Reagan, a poor County Tipperary emigrant who settled in Illinois in 1858. The 1860 census of the town of Fair Haven, Carroll County, Illinois lists Michael Reagan, then 25, and his wife Catherine Mulcahy, five years older and their four children. Michael, a soapmaker in England after leaving the scrub town of Ballyporeen, turned to farming in the Midwest, helped by generous government allowances to settle. His income is reckoned at $1,200 in the same census, a handsome living for the time, especially for an emigrant so lately come to the U.S.
Michael Reagan’s daughter Margaret, married to Iowa shopkeeper Orson Baldwin, was the person who brought up her orphaned nephew, Jack Reagan, Ronald’s father. It was from her that Jack got his conviction and pride in his Irish heritage. The Reagans, in fact, were all raised Catholic until Ron’s generation, when he took his mother’s religion, while his brother Neil kept his father’s Catholic faith. Jack and Nelle had been married in Fulton, Illinois in 1904 and Ron was born in nearby Tampico in 1911. His brother Neil had been born two years earlier. The early Irish influences of family and friends were to leave a mark on the young Reagans. Neil became a committed Catholic and the family historian, whose knowledge of his Irish roots and history was far more extensive than the President’s. Ron on the other hand often gravitated towards people of like backgrounds, most notably in his Hollywood days when he became part of the “Irish Mafia” of film stars, counting Pat O’Brien, William Holden, and other Irish-Americans among his closest friends. Reagan, of course, visited Ireland during a diplomatic mission to Europe he undertook for President Nixon when he was Governor of California. His son Ron remembers Reagan Sr. telling him excitedly about his experiences. At the time it was still not clear where the family roots went back to. 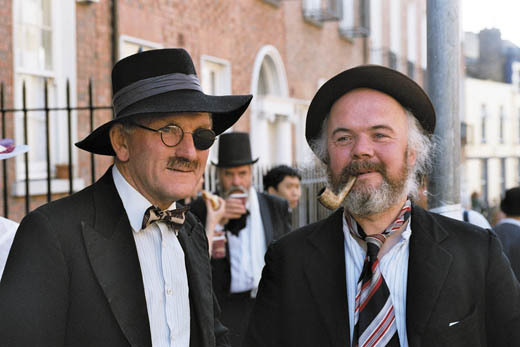 (When he was elected President, a branch of the family in Co. Cork tried to claim the roots.) Accompanied by his wife Nancy, Reagan spent considerable time on that trip speaking with genealogists about the background to his family name and where the Reagans might have come from. When he assumed the Presidency, Reagan, apart from St. Patrick’s Day platitudes, made only one major statement on his interest in things Irish. That was his statement to the New York based American Irish History Society in November of 1981. There was some controversy before the dinner when Irish Northern Aid, (Noraid), claimed that they had successfully prevailed upon Teddy Gleason, an honoree at the dinner and head of the powerful Longshoreman’s Union to convince Reagan not to launch an all out attack on IRA supporters in the United States as originally planned. Noraid claimed that British and U.S. network TV crews had asked them in advance to prepare responses to the anticipated Reagan assault. Privately, dinner organizers afterwards admitted they had been hoping for something far better researched and documented but perhaps Reagan steered a clever path through opposing forces, the British and Irish-Americans, and the platitudes covered up a multitude. The White House denied there was any deviation from the set speech. Less publicly, Reagan continued correspondence with the Irish genealogists who finally set him right on his family background. According to Neil Reagan, the President regularly called him when new information was revealed. Irrespective of what Ronald Reagan’s real opinions on his Irish roots were, and there is little evidence really to work on, there is no doubt that a visit to the land from whence 40.7 million Irish-Americans had sprung was a good election year ploy. The 40th President always had an exquisite sense of timing and a trip to Ireland in June, with the election in November, can only have helped his prospects. The President of the United States, returning, a century and a quarter later, to the land his ancestor Michael Reagan had left in abject poverty in 1858 was a great moment for the millions of Irish-Americans who shared his heritage. Reagan was acutely aware of that. After the unsuccessful assassination attempt on his life, President Reagan called in the secret service guard Timothy McCarthy who had saved his life by stopping a bullet intended for the President. He read the list of names of those injured on that fateful day, Delahanty, Brady, Reagan, McCarthy. “Do you think he (the shooter, John Hinckley) had something against the Irish?” he asked McCarthy smiling. President Ronald Reagan with his extraordinary gift of the gab, and his humor could certainly count himself among that tribe. Moore has always worn his Irish-American roots proudly on his sleeve, going so far as to say they played a role in his desire to question authority. A recent New Yorker magazine profile of Moore was particularly intriguing when it depicted the best-selling author and filmmaker talking before a crowd in Liverpool, that famous Irish city in England. But because Moore has been dominating the spotlight, lots of other Irish movie activity at festivals across the U.S. has gone unnoticed. Some of the movies have been seen already, but others are exciting projects to keep a look out for. 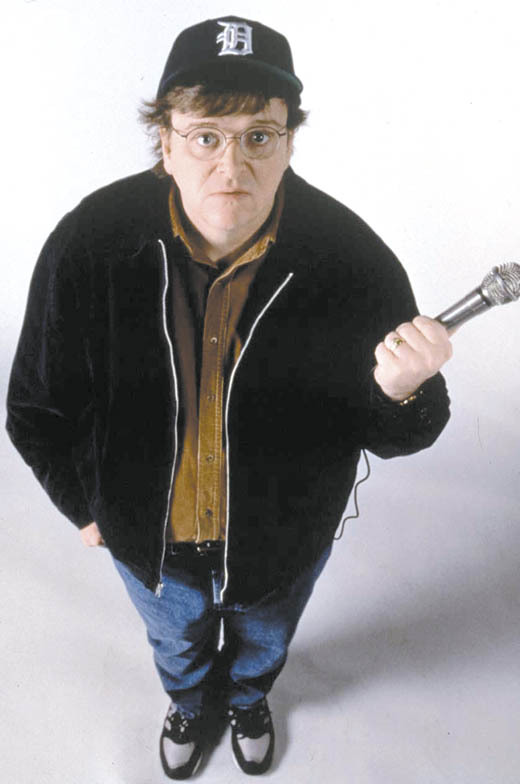 Michael Moore takes on President Bush in Fahrenheit 9/11, which was a winner at Cannes. At Robert DeNiro’s Tribeca Film Festival back in May, there was an impressive amount of Irish talent on display. First up was Irish-American actor/director Ed Burns trying to get his career back on track with Looking for Kitty. Directed by and starring Burns, Kitty is the story of a high school baseball coach (David Krunholtz) and a down-on-his-luck private investigator (Burns) who searches New York for the coach’s wife, who has taken off with a fading rock star. Then there was the highly praised Blind Flight. In this drama, an Irish nationalist (Ian Hart) and an English journalist (Linus Roache) forge an unlikely bond as they are held captive for nearly five years in Beirut. 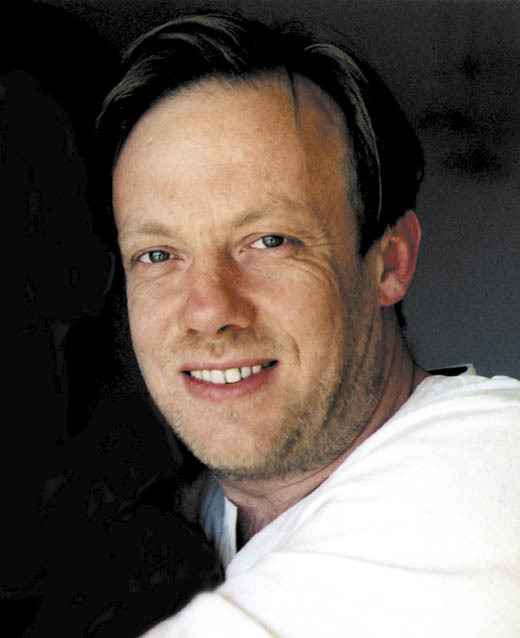 Based on actual events, Blind Flight was directed by John Furse. 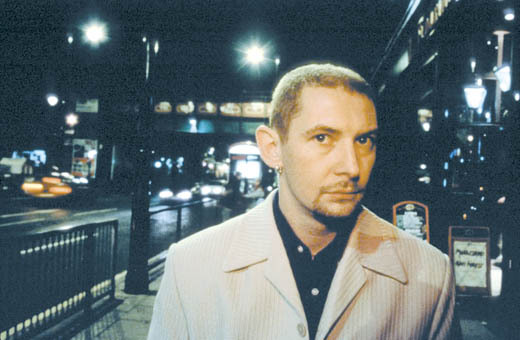 In fact, Ian Hart (who, coincidentally, is from Liverpool, with deep Irish roots) won the Best Actor in a Narrative Feature Film Award for his performance in Blind Flight at the third annual Tribeca fest. Actor Ian Hart portrays an Irish nationalist in Blind Flight. Also screened at Tribeca was An Unreliable Witness, the latest movie to explore the events surrounding Bloody Sunday in 1972. Thirty years later, in the film, journalist and eyewitness David Tereshchuk travels back to Northern Ireland to testify as part of an inquiry into the tragedy. (You may remember that Tereshchuk wrote about his experiences in Irish America). The documentary, directed by Michael McHugh, explores Tereshchuk’s involvement in, and memory of, this seminal event in the North. Also shown during the festival was Brotherhood, a documentary about the FDNY which features unprecedented access to various firehouses in Brooklyn, Queens and Manhattan loaded with Irish-American firefighters. Meanwhile, Irish talent old and new, with indy flavor or Hollywood hype, was offered up at April’s Philadelphia Film Festival. The highest profile Irish film to be shown during fest was Laws of Attraction, Pierce Brosnan’s latest. Set in New York City and Ireland, Brosnan stars alongside Julianne Moore in what was described as a romantic comedy in the Spencer Tracy-Katharine Hepburn tradition. The stars play dueling lawyers who also end up entangled romantically, but the film didn’t fare well at the box office. Perhaps the film at the other end of the hype scale, a small Irish independent film called Cowboys & Angels, will fare better when it is released later this year. The coming-of-age tale follows two best friends in Ireland — one gay, one straight — as their worlds change, and they move from the uncomplicated travails of youth to the very messy complications of adults. Cowboys & Angels was written and directed by David Gleeson. It’s his feature film debut. It won the Best Screenplay Award at the Newport Beach Film Festival this year, and is expected to hit select theaters in the fall. The movie Cowboys & Angels will be released in the fall. Finally, at the Philly Fest, there was Shade, starting Dublin actor Stuart Townsend, as well as Irish film veteran Gabriel Byrne. The film is set in the world of high-stakes poker playing, and tells the story of three con-men looking for one more big score which would allow them all to retire. Shade has a high-profile cast. Besides Townsend and Byrne, there are Sylvester Stallone, Thandie Newton, Jamie Foxx, Melanie Griffith and Hal Holbrook. However, the buzz on Shade has been quite tepid. This is just the latest tough break for both Townsend and Byrne. Townsend, of course, is dating Charlize Theron, who recently won an Oscar for her role in Monster. The eyes of the entertainment world are very much upon her to see what she does next. For Townsend, however, things have not gone so well. He was solid in the Irish film About Adam but that didn’t get a very wide release. He famously lost out on a big role in the Lord of the Rings series, and his only other notable film, Queen of the Damned, made it to theaters simply because the film’s other star, Alliyah, had died in a plane crash. Byrne’s career has also cooled off considerably, following roles in hits such as The Usual Suspects, and a big turn on Broadway in Eugene O’Neill’s Moon for the Misbegotten. Still, Shade apparently has enough going for it to earn a theatrical release, rather than a straight-to-video deal, of which there was much talk. 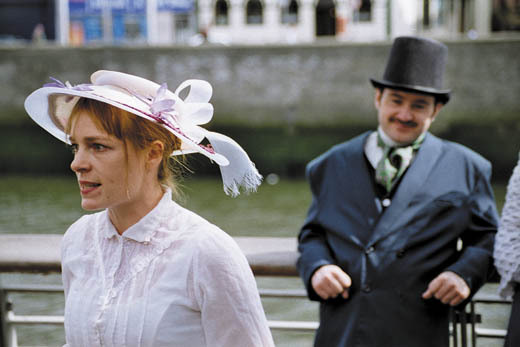 English actress Samantha Morton apparently enjoyed playing an Irish immigrant in In America so much she has decided to head over to Ireland for her next film. Morton, who received a Best Actress Oscar nomination for playing the harried wife and mother of an immigrant family in New York, will star in a comedy called Farmers on E.
The film, which also stars Robert Carlyle, will be shot in Ireland and revolves around a community of rural residents asked to turn their farms into a theme park. The film will begin shooting in September. As with Morton, Carlyle (a Scotsman) has also apparently taken a liking to playing Irish characters. Carlyle (best known for roles in Trainspotting and The Full Monty) just finished shooting a film in Belfast with X-Files star Gillian Anderson. The film will be titled The Mighty Celt. Anderson will play the lead female role alongside Irish newcomer Tyrone McKenna who portrays Anderson’s teenage son. Carlyle plays a family friend who returns home after a decade abroad. The Mighty Celt was written and directed by Pearse Elliott, and delves into the world of IRA operatives. It also becomes clear, as the film progresses, that Anderson and Carlyle’s characters have a long personal history. Around St. Patrick’s Day next year, look for Russell Crowe to be starring in a movie about famed New York Irish boxer James J. Braddock. The film, directed by Ron Howard, will be called Cinderella Man, and will recount the Depression-era life and times of the famed boxer who was seen as more or less a loser until be beat the feared Max Baer in 1935. The film’s title itself is an allusion to Braddock’s wild career. He was such an underdog in the battle against Baer that legendary journalist Damon Runyon dubbed Braddock the “Cinderella Man” after he won the heavyweight title. Braddock was a heavyweight from the get-go. One of seven children raised by Joseph Braddock and Irish immigrant Elizabeth O’Toole on Manhattan’s West Side, Braddock was said to be 17 pounds at birth. Finally, on the TV front there is good and bad news for Irish American talent. Perhaps most disappointing, ABC TV has canceled Bonnie Hunt’s idiosyncratic show Life With Bonnie. In somewhat less painful news, the Boston-set It’s All Relative — a culture clash sitcom pitting sophisticated gays against, um, earthy Irish Catholics — is also gone. But there is an Irish flavor here this summer. Starting July 21, The FX channel will present Denis Leary in a 13-episode FDNY drama called Rescue Me. Also starring in the show, set amidst the anxieties of a post 9/11 fire-house, is Jack McGee, himself not only an Irish American but one who served 10 years on the FDNY. And proving once again that the Kennedy clan can always be called upon, the WB network will present Jack & Bobby, about the boyhoods of JFK and RFK. One can only speculate just how authentic the show’s depiction of the brothers (Bobby was generally seen as the more “Irish Catholic” of the brothers) will be. The Irish rock band The Thrills have been taking the U.S. by storm this summer, and recently played a sold-out show in New York City. Following the success of their debut album So Much For the City, the Dublin band’s new album, which is not yet titled, is due to be released on September 13. Meanwhile, they are touring North America and Europe, playing summer festivals. For all you reality television viewers, Amanda Byram’s face may be recognizable. 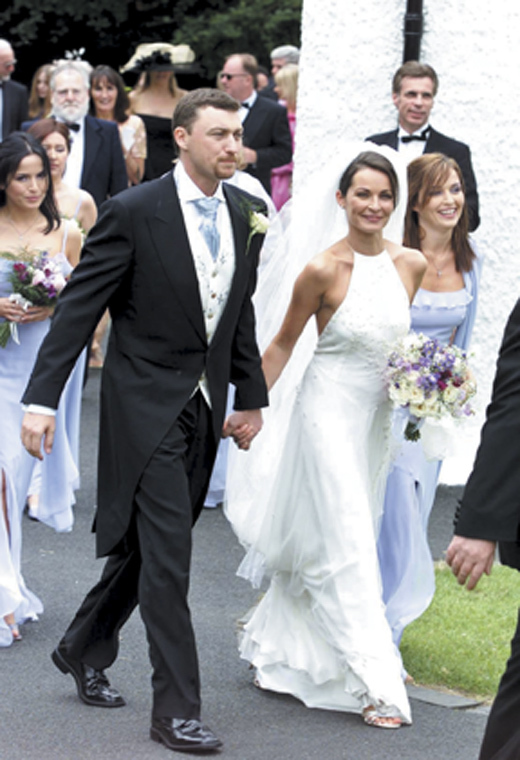 The Dublin-born and raised television presenter has been associated with three controversial reality television shows; one of which was cancelled before airing. Between her two hits Paradise Hotel and The Swan, Byram was more invested in The Swan. The show featured contestants who went through intense plastic surgery and competed to be part of the final beauty pageant at the end of the series. The show moved Byram, and she said that she and the participants were in tears everyday. She has been desensitized to plastic surgery in general. “It has become an everyday thing, I don’t know if that’s a good or bad thing,” she says. She is lined up to present The Swan II, which is currently in the process of casting new contestants. Byram has had more than a few problems with people who mistake her accent. This past season on Saturday Night Live, comedian Maya Rudolph parodied The Swan and said Byram was British. She retorts, “It’s so annoying because no one can distinguish my accent!” Perhaps that is because Byram lived in London for four years. Whether or not she sounds like she’s from Ireland, she certainly credits her Irishness for her success. “My ability to sit down and talk to anyone and everyone is my most Irish characteristic,” she says. One of this summer’s biggest blockbusters, King Arthur, has a very strong, yet subtle, Irish influence. Moya Brennan, former lead singer in Clannad who was interviewed in the June/July issue of Irish America, features prominently on the film’s soundtrack. Lending her signature ethereal and timeless sound, Brennan contributes vocals and co-wrote some of the music with the composer Hans Zimmer. 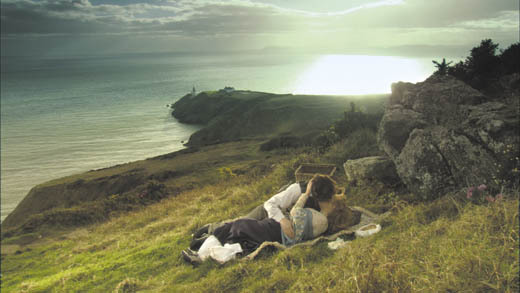 Adding to the Irish feel of the movie is the location – most of the film was shot in County Wicklow.